Home WP Original Stories Is Lori Lightfoot ready for a potential Chicago teachers strike? When Rahm Emanuel took over City Hall in 2011, he was hailed as the agent of change that Chicago badly needed. His tough guy reputation was especially sought after given Mayor Richard M. Daley had done little to take on the city unions. The city and school district’s crumbling finances were evidence of that. All that quickly changed when Rahmbo caved to the Chicago Teachers Union (CTU) early on in his first term. The teachers went on strike in 2012 and ended up getting what they wanted, and more, from the new mayor. Never mind that the district was already running billion-dollar deficits and had an $8 billion pension shortfall. Emanuel was never the same after that and CPS is still reeling from the consequences of that deal. It’s a lesson incoming Mayor Lori Lightfoot should heed. Her progressive credentials won’t be enough to placate the city’s public sector. She’s going to need all the help she can get when Chicago Public Schools starts negotiations with the CTU over the next teacher contract. That’s especially true now that the state legislature is set to strip some of Lightfoot’s bargaining power. In 1995, the legislature removed the CTU’s ability to officially bargain over items such as class size, length of the school day, length of the school year, student assessment policies, and more. Now the House just voted to give that bargaining power back to the CTU. The Senate is up next. With even more ammunition and the ability to flex its muscles on the way, a teacher strike has become more likely. Lightfoot needs to give as good as she gets from the CTU. Chicago simply can’t afford the unions’ over-the-top demands, such as providing affordable housing for teachers and guaranteed sanctuary status for undocumented students in classrooms. 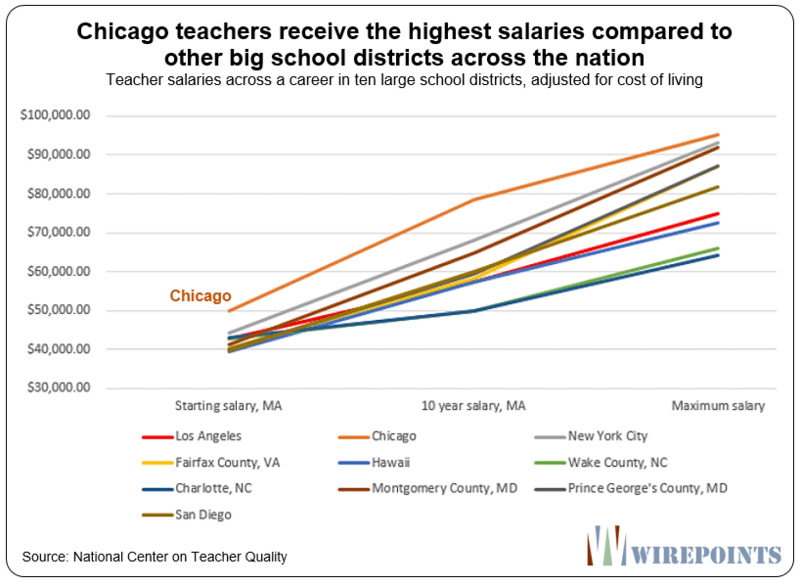 According to data from the National Center on Teacher Quality, Chicago already provides the highest compensation to teachers among some of the largest school districts in the nation. For example, a Chicago teacher with a master’s degree receives $80,000 a year after ten years of work. In contrast, an equivalent teacher in New York City makes $70,000 and a Los Angeles teacher makes $60,000. 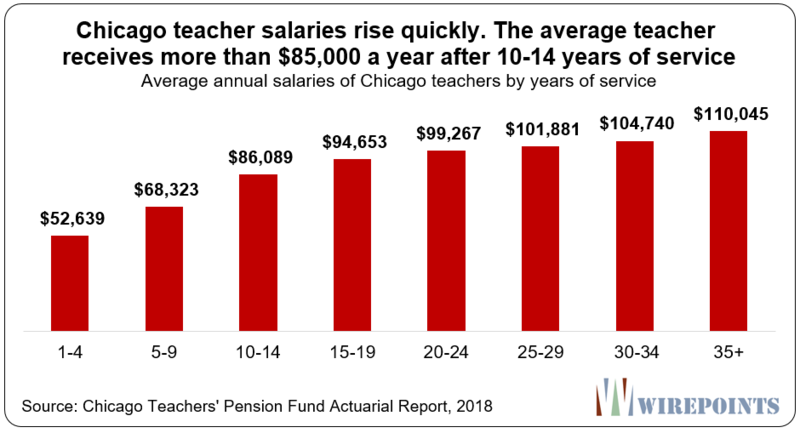 A big reason for that is how fast Chicago teacher salaries tend to grow. The average new teacher with just 1 to 4 years under their belt starts out with a salary just above $50,000. In 10 to 14 years that salary grows to more than $85,000. High salaries translate into big pension benefits for career teachers. 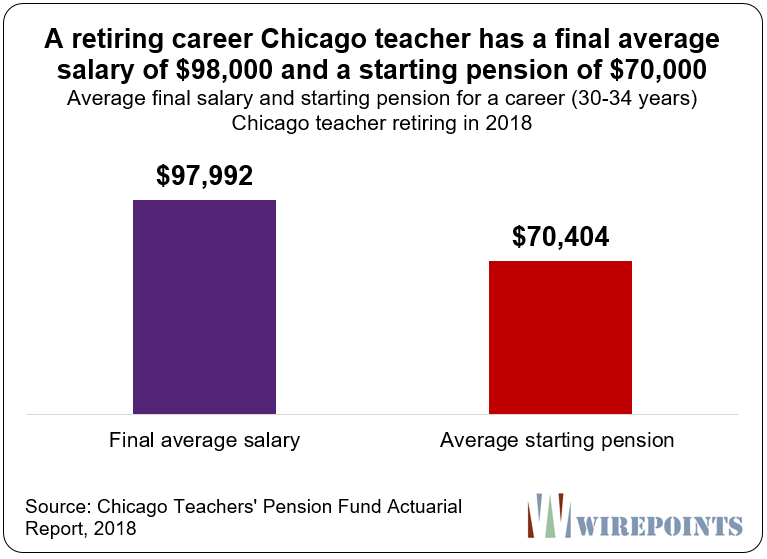 The average CPS teacher who retired in 2018 with 30-34 years of service had a final average salary of nearly $98,000 and a starting pension of over $70,000. In all, the average retired career teacher will collect over $2.1 million in benefits over the course of her retirement. 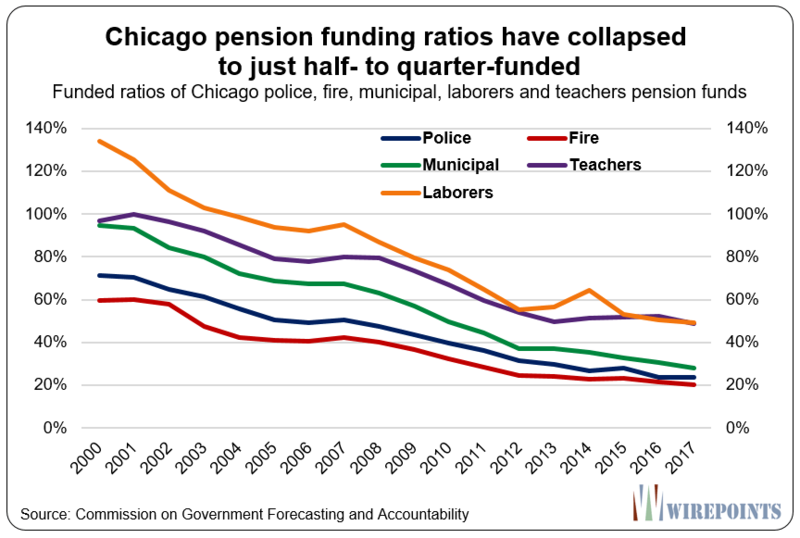 The Chicago Teacher Pension Fund is in dire fiscal shape along with Chicago’s city-run pension funds. It has just half of the money it should have on hand to ensure it can make benefit payments. That 50 percent funded ratio for CPS pensions translates to about $11 billion in official pension debt, or nearly $25 billion in debt under Moody’s more realistic calculations. That’s a huge amount, but teacher pensions are just a part of the the total pension burden imposed on Chicagoans. 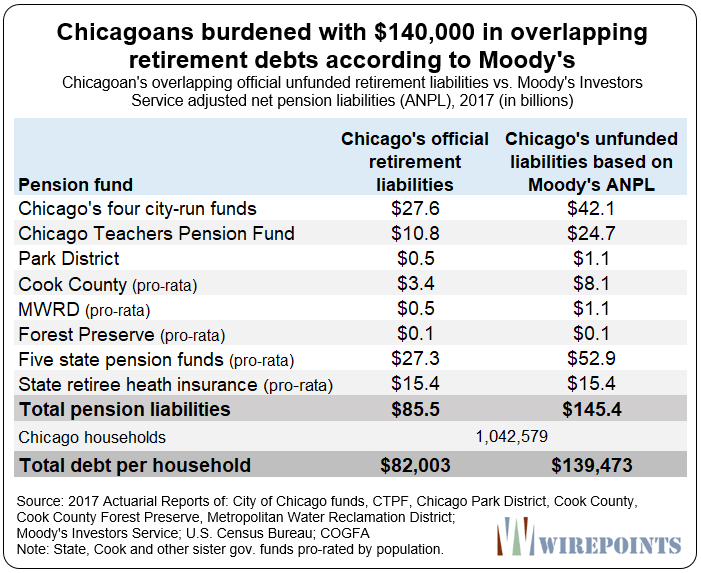 When you add up all the Moody’s-calculated pension debt from the city, the school district, sister governments and the state, each Chicago household is on the hook for $140,000 in overlapping retirement debts. One of the CTU’s demands calls for the CPS to spend more money on hiring more teachers and even more support staff. That might make sense in a dynamic, rapidly growing city with a growing school population. But CPS is losing students and has been for nearly 20 years. At the same time, the district’s spending per student has jumped. 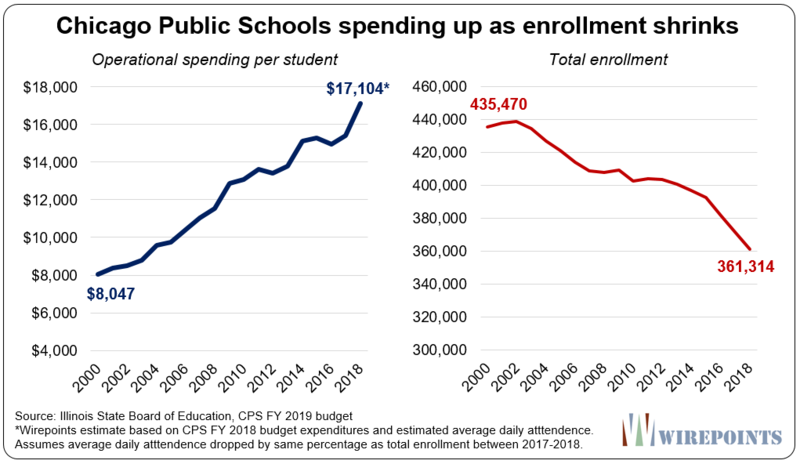 In all, CPS’ per student spending has doubled since 2000 according to ISBE, even as the district’s enrollment has fallen by nearly 75,000 students, or 17 percent over the same time period. Declining enrollment has led to the emptying of schools all over the city. 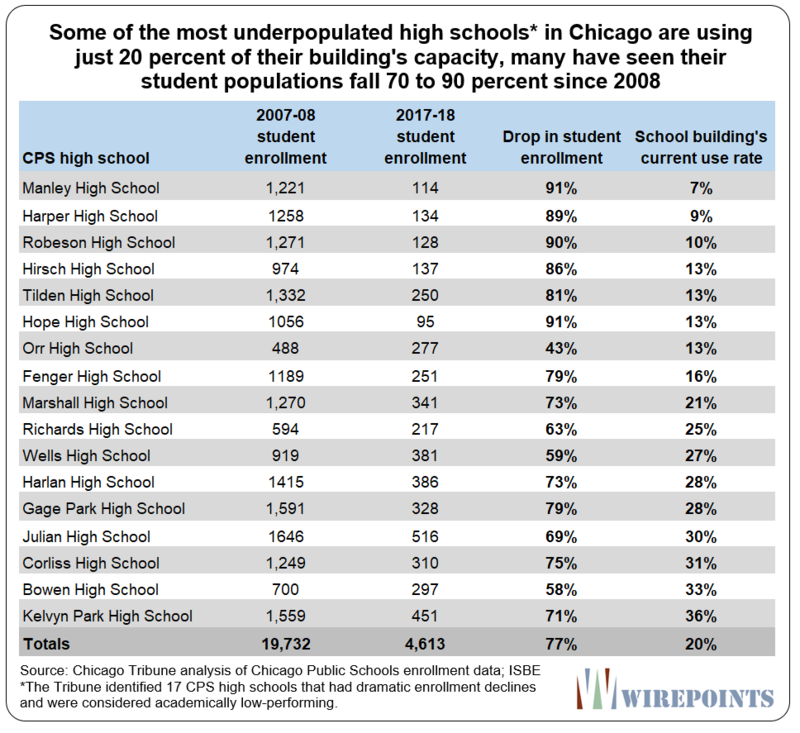 Last year, the Chicago Tribune examined the demographics of some of the most underpopulated schools in Chicago. It found the enrollment of the 17 worst schools has dropped from nearly 20,000 in 2008 to just over 4,600 today. Their buildings are on average filled to just 20 percent of capacity. And the few students that do go there aren’t getting a good education. In those schools, no more than 8 percent of students are ready for college. In any sensible world, those near empty schools would be closed and resources redirected elsewhere. Not in Chicago. The CTU has advocated against closing any of those nearly-empty, failing schools. The statistic that best sums up Chicago Public Schools’ crisis is its credit rating. 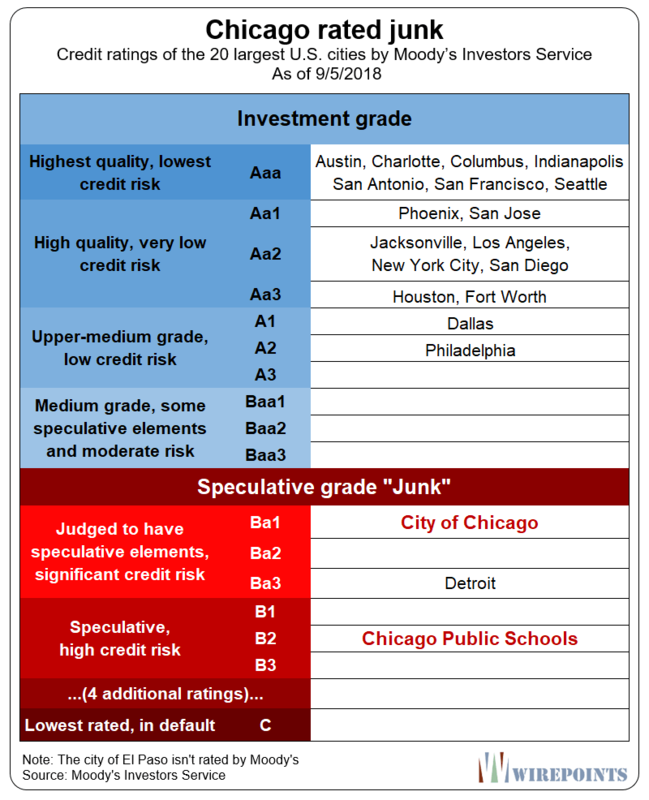 Moody’s rates CPS five notches into junk, worse off than even the city of Detroit. Chicago is junk too. It’s the only major city in the country besides Detroit to be rated junk. The city can’t afford more bad contracts when it’s already this bad off. Illinois taxpayers bailed out Chicago Public Schools so the district could do what? Lightfoot and the union are birds of a feather, they both put the public sector above the private. She will cave or that union will flatten her like a frog trying to cross the Dan Ryan. The only “compromise” they will come to is how to mitigate public perceptions so neither party loses in the press. But behind the scenes of all that, the taxpayers will get screwed over, and nobody will ever give a second thought about what’s best for the kids. It will only be about fattening up the public sector, to hell with the kids. Chicago needs someone like President Reagan sitting across from the CTU, not Lori Lightfoot. She will cave just like her liberal predecessors. Wake up Chicago! Wake up Illinois! The bad guys own this land. You can fight in futility, accept their rule, or flee now before it’s neighboring states start discussing a border wall. I wouldn’t blame them. Crippling debt, increasing socialism/Marxism, the newly elected mayor — these are symptoms of our decades long disorder and disease. When will we choose to correct our foolish ways and heal ourselves?